If you are interested in the potential of an above-average income opportunity* and have the desire, motivation, and qualifications to be successful in the training and consulting field, then negotiatingcoach.com® has limited opportunities for you to become a certified affiliate. As a qualified licensee, you will be responsible for marketing, selling, and presenting all the Secrets of Power Negotiating® programs and providing fee-based negotiating consulting and coaching services to your clients. You will be able to maintain the freedom and flexibility to determine your appropriate professional fee structure and pricing in consultation with negotiatingcoach.com® and will be listed as an affiliate on the negotiatingcoach.com® website. Are you a consultant, trainer, professional speaker, or businessperson interested in adding the recession-proof topic of negotiating to your service offering? Do you have the confidence, experience, expertise, and capabilities to be successful at acquiring your own clients, selling and delivering negotiating programs, and providing coaching advice to clients in your geographic market or industry niche? 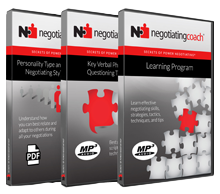 Michael E. Sloopka, Founder and President of negotiatingcoach.com®, will provide limited e-mail and phone-based assistance** to each affiliate about the Secrets of Power Negotiating® system and methodology. If you are interested in becoming a certified affiliate in the available geographic markets or specific industry niches, then please send an e-mail to Michael E. Sloopka at michael -at- sloopka -dot- com outlining why you are interested in becoming a affiliate. I will contact you to discuss your experience and qualifications prior to proceeding with the formal application process. * Revenue and income potential will vary by affiliate. No guarantees are made concerning income potential. ** Assistance is subject to the limits and parameters outlined in the license agreement.